There are loads and loads of different types of pickles made with all kinds of different vegetables. Here are some you’re most likely to come across. These pickles are very popular because they’re so easy and quick to make. Just about any kind of vegetable can be turned into quick pickles, but popular types are cucumber, aubergine, cabbage and mooli radish. You can get handy quick pickle mixes or pickling solutions to make your own at home. We particularly love the bonito fish and kombu kelp flavour. Quick pickles have a very light flavour that makes them a great match to all kinds of dishes. However, because they’re only pickled for a short time and are not fermented, you have to eat them before they spoil! Miso pickles can keep for much longer than quick pickles and have a very rich taste. Perfect for vegetables with a strong flavour, like garlic, miso pickles can be as simple as popping your prepared veg into a tub of miso! Miso pickling is very flexible and many things that are not quite a ‘pickle’ can be popped in a bit of miso to give them a delicious flavour. Grilled misozuke pork, fish or beef are popular dishes. If you go to a Japanese shopping arcade or department store basement, you’re sure to see some of these pickles sitting prettily in their bran tubs. Although they are quite tricky to maintain and season properly, many Japanese households still have their own nukadoko or rice bran bed they use for pickling. 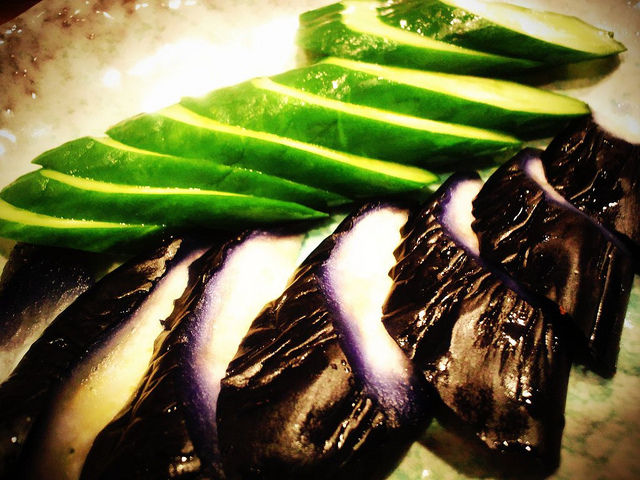 Nukazuke have a subtle sour-salty flavour and are a favourite for preserving regional specialities of vegetable, as they also preserve the natural flavour. An iconic pickle! Mouth puckeringly sour, yet sweet at the same time, bento and onigiri across the world would be much sadder without the humble pickled plum. In the past when bento were packed in aluminium tins these plums would wear away at the metal over time! 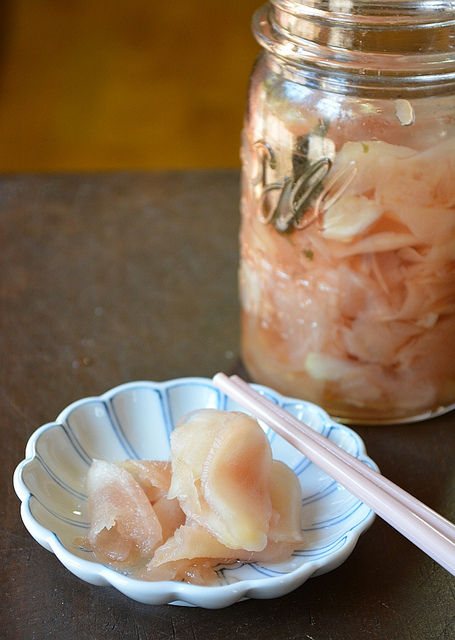 You may have tried a few different types of pickled ginger. They’re all delicious, but make sure you choose the right one for your dish! Sushi Ginger or Sushi Gari: Known as gari due to the crunchy ‘gari gari’ noise it makes when you eat it! Sushi ginger is traditionally eaten as a palate cleanser between different pieces of sushi. However, it’s zesty sweet flavour makes it really addictive and many Western sushi fans will use it in fusion sushi or salads to add a bit of pep. Hajikami Ginger: If you’ve had grilled fish (especially Miso Black Cod) at a fancy restaurant, it was probably served with some of this delicious stuff. 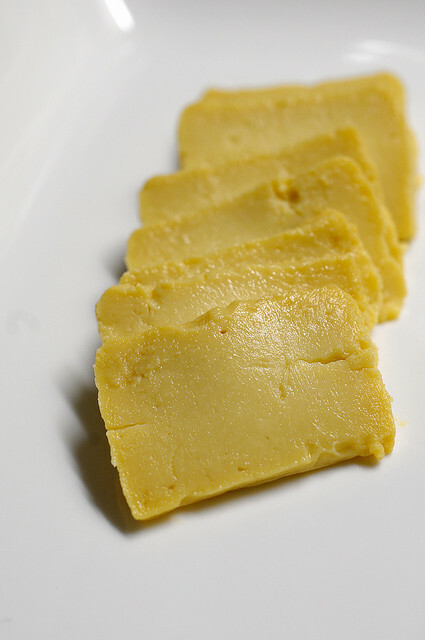 Hajikami is made from pickled ginger shoots, has a refreshing flavour similar to sushi ginger, and is less fiery than beni shoga style ginger. Beni Shoga: If you’re an okonomiyaki aficionado you may be familiar with this pickle! The intense gingery flavour of beni shoga makes it great in strongly seasoned dishes. It’s a bit too strong for sushi, though, so don’t get them confused! You can check out some of the wide range of pickles available online at Japan Centre. Try them and discover your favourite! Posted in Food and tagged Diet. Bookmark the permalink. Hello! I was curious, in regard to pickles, if I were to buy some of the types you sell in store, how do you recommend to store them after opening?